The q-PCR Standardisation Project is designed to address the inconsistencies of q-PCR results reported between labs in different regions and countries. Professor Tim Hughes and his colleagues, co-founders of the International CML Foundation (iCMLf), initiated the global standardisation project seeking a wide adoption of the International Scale (I.S.). The aim of the project is to recruit labs to an internationally standardised scale for reporting q-PCR in as many cooperating countries as possible. The I.S. enhances the ability to accurately gauge whether a patient’s response meets the internationally agreed TKI therapy goals and milestones CCyR and MR3, as well as deeper molecular responses, MR4, MR4.5 and MR5. It is important to remember that the above levels of molecular responses can only be reported when there are adequate numbers of control gene transcripts present in a sample. Early detection of a significant rise in BCR-ABL1 gene transcripts is agreed by both European LeukaemiaNet and NCCN, as an important indication of a potential loss of response, suboptimal response or treatment failure. The strength of an International Scale (I.S.) is its potential to be used as a common reference baseline against which an individual’s response to therapy can be accurately measured. Currently there are upwards of 200 labs that are validated on the I.S. However there are still over 1000 labs that are not currently using the International Scale, and even where they do, not all doctors report q-PCR results according to the I.S. to their patients. This causes confusion for patients who try to assess their response to a particular therapy according to the ELNet recommendations or NCCN guidelines. Samples taken at diagnosis from a group of 30 patients enrolled in the IRIS trial (2000) were measured by three different laboratories: Adelaide in Australia, Mannheim in Germany and Hammersmith in London. An average of the 3 reported values were agreed as the baseline reference value and defined as 100%I.S.. Test results from the IRIS study were then reported in 1 log (tenfold) reductions from this baseline. Conversion Factor: How a specific local lab value is calculated to allow for conversion to I.S. Currently most patients need to continue to take TKI therapy on a daily basis, even after achieving a stable molecular response shown by q-PCR testing. Whilst it is agreed that deeper molecular responses within specific timelines reduce the risk of progression or development of resistance to therapy, issues around the measurement of residual disease still remain. Reliability- can the result be repeated? 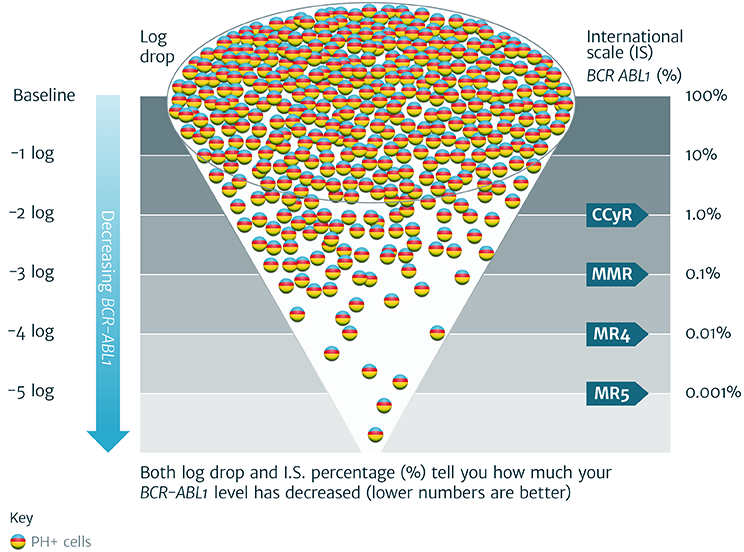 BCR-ABL1 transcript levels are undoubtedly an important indicator of clinical response to TKI therapy. When assessing results from q-PCR testing it is important to look at the trend of several results from a consistent testing source rather than any one single test result. The quality of samples as well as differences in ‘control’ genes, sensitivity of machines, baseline references and reagents, all conspire to make it difficult to compare results reported by different laboratories. A case in point is that of a patient who switched testing from a non-validated lab in the USA to an I.S. validated lab in the UK. The difference in results went from 0.0032% (MR4.5) reported by the non-validated lab to 0.1% (MR3) reported by the I.S. validated lab. This represented an increase of 2 logs and was understandably very unsettling for the patient involved. For CML patients whose disease is monitored by q-PCR, the message from this and other examples is that ‘not all laboratories are equal’. As an informed patient, it is important to know the pedigree of your q-PCR results. Switching labs may well be unavoidable and is a complex problem, particularly in the USA where health insurance companies often determine the choice of lab. Should you need to change your doctor, in order to ensure consistency in your test results you should request that your samples are sent to the same laboratory used prior to your move.